What Happens to Tattoos When You Get Fat? Your skin stretches when you gain weight. Anyone who has ever put on a few pounds has seen this effect for themselves. So naturally, when a tattoo is imprinted on that skin, your tattoo will be affected if you gain weigh. The degree of alteration that take place is influenced by where the tattoo is located and how much weight is gained. When you gain weight, the skin that your tattoo is on stretches. Depending on a variety of factors, that stretching may or may not make the tattoo look a great deal different from what it originally looked like. A large factor in how much stretch you see comes from how much weight you gain. If you gain 10 lbs., it is unlikely that the tattoo will distort enough to change its appearance drastically. If you gain 40 lbs. though, most tattoos will start to distort. Getting pregnant is certainly not the same thing as getting fat. However, it does cause a rapid expansion in the midsection of a woman. This can cause severe distention to a tattoo in this area of the body. 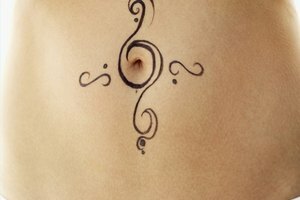 However, usually getting pregnant in itself will not stretch or distort tattoos that are elsewhere on the body. 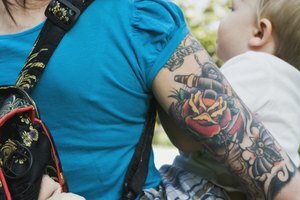 The conventional advice from tattoo artists is that women should wait until sure they don't want children or are done having them to get a tattoo on the belly area. Stretch marks cause far more problems for a tattoo than simply gaining weight does. Stretch marks change the texture of the skin itself, and cause it to wrinkle and pucker in odd ways that can greatly distort a tattoo. However, some people choose to get a tattoo after stretch marks have appeared. A well-done tattoo can help to cover up and draw attention away from the unsightly marks. Some locations on the body will not stretch or deform as much if you gain weight. These are safe places to have tattoos in the event of sudden weight gain. The feet and the hands are probably some of the best spots for these types of tattoos. The upper chest or collarbone area is also probably a safe bet as long as you don't end up gaining too much weight.